As much as we love a good music marathon, it’s getting chilly and we’re feeling like staying local. 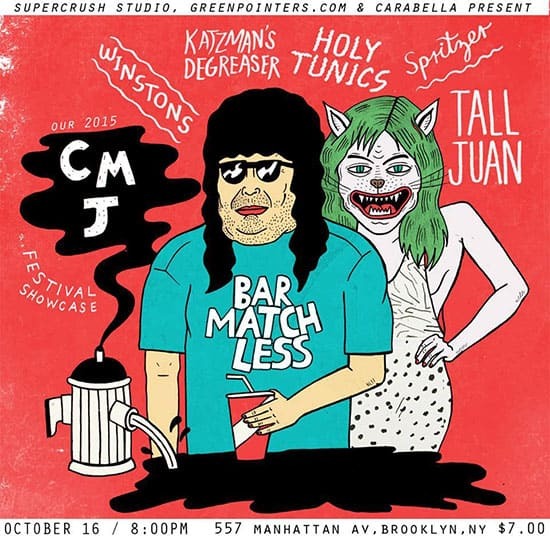 So for this year’s CMJ Festival we’ve partnered with SuperCrush Studio and CaraBella to put together a showcase right here in Greenpoint. Join us Friday, October 16, 8PM at Bar Matchless (557 Manhattan Ave.) We’re expecting a hassle free, good time that won’t break the bank! There’s something really endearing and nostalgic about Holy Tunics that we love. And it’s not just because they put out a tape for Cassette Store Day. We’re digging this sweet music video for “Clutching the Straw Map to Your Heart.” Awww! Ben Katzman’s DeGreaser is ” here continue the cult and culture of overtly self-aware rock antics that act completely un-self-conscious, all the while invoking your favorite shredders while having a laugh at the album rock canon as well” says Impose Magazine.